40-60% of users who sign up for a free trial of your software or SaaS application will use it once and never come back. If you think I’m wrong, I bow to your data. If you have no data on this subject, start tracking it: everyone who I’ve ever told to do that comes back shocked and dismayed. There are many reasons why a user would abandon an app that early. It might not have been a good fit for them. They might not have been well-qualified by the pre-app marketing. They might just have gotten busy or had their own priorities change. However, people largely abandon applications for reasons which are within our control: because they do not perceive value from interacting with the software. We can decrease their abandonment rate by a) making our software better and b) communicating better with our users. Many companies produce software whose first-run experience is an accident. Here’s the software. Here’s a user. User meets software at an unpredictable angle and unpredictable speed. Mayhem ensues. Ambulance called. This is our fault. Instead of throwing the user into the software and hoping they understand it, we should actively craft their first experience. What should we strive for? We should make the user experience, in as quick and obvious a manner as possible, a positive improvement in their lives. To channel Kathy Sierra: they should get more awesome at something within their first five minutes. We should have the user take some action which results in something which is relevant to our business. We should give the user a clear and compelling reason to return. My first software product was Bingo Card Creator. The goal of my first-run experience hasn’t changed in six years: I want an elementary schoolteacher to walk over to her printer, take a look at the bingo cards she’s just printed, and think “Wow, my class will love these”. Accordingly, everything about the first-run experience is designed to get her a step closer to smelling that ink toner. Anything which distracts her from that is waste; there are configurations and customization options she can make, but she can make those later, she needs to feel awesome right now. So, as UX designers we’ll first start by writing down these three goals: one awesome improvement for the user, one thing the business can hang its hat on, and one compelling reason to come back. Now we have to actually accomplish them. How are we doing to do that? Given that we want to enter into a mutually beneficial relationship with the user, we should start by talking to them, early and often. One easy way to do this is to offer the user the opportunity to take a product tour inside the product. We can use this tour to guide the user through the the basic use of the software, accomplish one awesome thing, and then close with an explicit ask for the business result which we care about. Take users through a prepared sequence of defined steps, such that anyone who completes the sequence will have accomplished all of our goals. Respect users’ choices throughout the tour, but try to decrease their burdens wherever possible. The tour shouldn’t feel like work. Offer intelligent defaults. If there is a decision the tour requires from them, we should have an easy default ready to suggest, or we should make the decision a magician’s choice where all decisions are the right decision. Favour brevity over comprehensiveness. There is a place for rich depth in an offering, but for the first five minutes, we want to focus on quick wins. Collect qualitative and quantitative data to improve the tour over time. Fog Creek Software makes a product called FogBugz, which does bug tracking and project management. The FogBugz tour focuses on how the user, likely a software developer, can collaborate with their team better over FogBugz than say using email. When they first start the free trial, they’re given a one-click option to either take or dismiss the tour, and they can quit it at any time. The user always remains in control. The tour walks through the basic operation of the software while explaining how that will make their development process better. It then concludes with an explicit invitation for them to invite their team members into FogBugz. This is of key interest to the business (FogBugz is priced per seat), but also of key interest to users (it’s more valuable with your team onboard), so encouraging them to do it is in the interests of everyone involved. It’s whimsical, fun, and very Fog Creek-y. Fog Creek is basically a community dedicated to the proposition that software development should not feel like filing TPS reports. In addition to being whimsical and fun, it works! It frequently convinces users to do something non-obvious which will make their lives better and help Fog Creek sell them the product more effectively. I mostly identify as an engineer, but I think some of the disciplines on the marketing side of the house can create a lot of value if we steal actively repurpose them. One of these disciplines is called funnel analytics. We can measure a user’s progress through the tour by looking at the completion of each step. This creates a graph that looks like a funnel; many people enter at the top, few people exit at the bottom. Once we’re measuring where people exit the funnel, we can make efforts to improve the experience or communication at that stage. There are a variety of tools you can use to measure funnel effectiveness. Here’s the funnel for the first run experience of Bingo Card Creator. Here we can see most of the work separating an elementary school teacher from being delighted by the cards coming out of her printer. Since the software is online, I can’t track actual printing, so I use downloading the PDF file as a proxy for it. 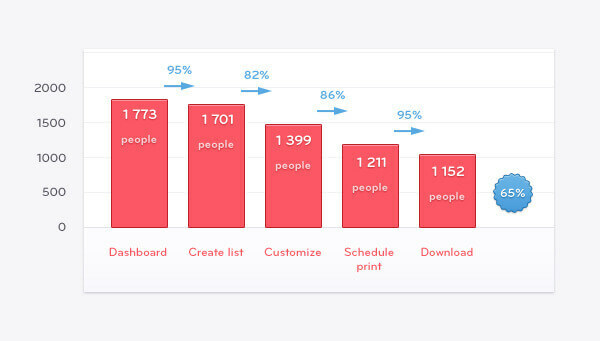 We can observe that there is a small drop-off in funnel completion between Dashboard and Create list (95.9% of users having reached Dashboard will successfully create their word list), but there are significant leaks between “Create list”, “Customize” and “Schedule print”. This is where I focus my efforts as a UX designer, as it is likely I can achieve big wins there rather than chasing a 95% to 96% improvement. One of the UX challenges in this application is keeping users informed about how much longer it would take to get their cards printed. The whole process is designed to take literally seconds, but often users assume there is a lot more work to do and quit. As part of a redesign, we tested having a constantly visible progress indicator, on the theory that this would increase completion of the Customize step. We also implemented a few UX affordances such as, for example, making clicking on later stages in the progress indicator an alias for “Make no changes to the default settings for this and proceed to the next step”. This improvement was very successful: only about 82% of customers made it through the Customize step on the previous UI, but almost 90% made it through with the new UI. For the price of adding an interface element, we increased by 10% the number of teachers who actually succeeded with Bingo Card Creator on their first use of the software. In addition to eventually increasing our sales (that took a little more work—long story), this had the direct result of us teaching 10% more kids how to read with a UX improvement. That’s the best kind of test result. Intercom excites me for many reasons, and one is that you can use it for in-app messaging. This allows you to basically bootstrap much of the tour just by using their in-app messaging framework, without having to spend weeks implementing custom code. Also, because the messages are external to the application and editable in a nice GUI, you can have marketing or product team members iterate quickly without needing to involve developers every time someone needs a button moved. Also, this tends to introduce less coupling of the application and the tour, which—I can tell you from painful experience—tends to cause both to break when either is being iterated on very quickly. I encourage you to give Intercom a spin, to see whether you can use new communication capabilities to start mutually interesting conversations with your customers. We’ve seen how tours get users to happy use of the software on their first experience. This decreases abandonment rates by itself, but it is not the final technique for improving retention. One thing that tends to work very well is lifecycle emails: contacting users with messages that they will enjoy, based on their actual experience of using your software. For example, you could envision a project management app sending a ‘Getting Started’ guide to someone who had not created a project after a week, but also sending a ‘How To Work With Remote Freelancers’ guide to someone who is actively using the software in such a way that they would probably be interested in that. The sky is the limit for how creative you can be on this. Intercom also lets you implement lifecycle email in addition to in-app messaging. I think it is a wonderful experience, particularly when the team members in charge of lifecycle emails are less technically inclined and can’t make changes to the code base to, for example, hook up triggers themselves. Intercom gives them a comprehensible WYSIWYG interface for hooking up triggers and messages without needing to constantly bring developers into the project. Everyone knows they should be doing lifecycle emails, and products like Intercom make them simple to set up. However actually getting started on writing them is still a bit of a mystery. Designing landing pages to capture signups, doing copywriting, pacing the messages such that customers perceive value from them, and iterating towards making measurable improvements in business goals is not trivial. You can however learn how to do it. I did, and you’re probably at least as smart as I am. It will, however, take you time. You can hire someone to do it for you, but there are not nearly enough of them available right now, and everyone is trying to hire them simultaneously. Here’s a third option for you: I sell a downloadable course on lifecycle emails which teaches you and your team how to execute on this. Jason Cohen, one of my consulting clients, remarked “Patrick’s advice on starting a [particular type of lifecycle email] campaign for WPEngine was an epic win for WPEngine—it permanently moved the needle on signups after just a week of work”. That was a drip marketing campaign—for more on them, see Chapter 2 of the course. The Intercom blog is read by thousands of entrepreneurs, developers, and designers. If you’d like to publish an article here, drop a mail with your proposed topic to des@intercom.com. Be warned: we maintain a very high standard for our articles.